While I have always been puzzled at why Americans endorse the existence of a religious and therefore discriminatory nation, Israel, and at why we give more of our tax-money to that nation than to any other; and while I would not pretend to be an authority on those matters; I was stunned on 31 March 2015 to read a news report at counterpunch, “American Historical Association Censors Ad for Book on Israel, Palestine & the US Keeping ‘Hidden History’ Hidden,” by Alison Weir, someone I’d never heard of before. 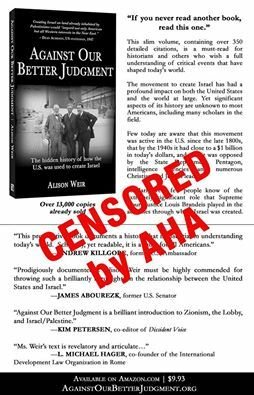 She says there that AHA refuses to accept a paid advertisement for her historical book about the U.S.-Israel relationship — a historical matter that I have always found puzzling, and so was curious to know more about. However, before I would proceed further into this, I wanted to know something more about the author, to find whether she might be an anti-Semite, such as all-too-commonly are writing against Israel. I came upon this youtube presentation by her, “TalkingStickTV – Alison Weir – The Hidden History of How the U.S. Was Used to Create Israel.” In that hour-long talk, she explained how her interest in the issue of Israel and the Palestinians had arisen starting in 2000, and she showed photos that she took in Gaza. She described the circumstances of her having gone there, as a journalist, to see the situation for herself. Nothing about her suggested to me that she was any sort of anti-Semite, or bigoted in any way. She went on to summarize the main evidence on which her book relies, all highly respected sources, such as this, which not only is a respected scholarly source, but the footnotes in it are likewise respected and mainstream sources. Basically, in her hour-long video talk, she made her case.